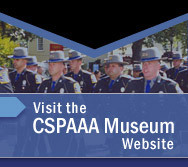 THE CONNECTICUT STATE POLICE ACADEMY ALUMNI ASSOCIATION, INC.
3. And to assist with any civic program undertaken by the Connecticut State Police Department. 1. Graduation from the Connecticut State Police Academy or from an accredited course of study elsewhere, as prescribed by the Commissioner of The Department of Public Safety as a requisite for entering into the Department. 5. Termination of honorable service in the Department, for any reason, voluntarily and without prejudice. Active members of the Corporation are the sole voting members of the Corporation. Any person who is, or who has been, an employee of the Connecticut State Police Department, for at least five (5) years, but is not eligible for Active Membership, may become an ASSOCIATE MEMBER following recommendation by the Membership Committee. Associate Members, upon acceptance and payment of annual dues, shall be entitled to all privileges of active members except the right to vote and hold elective or appointed offices in the Association. Endorsement of applications for membership shall be made by a simple majority of a vote, of the members in attendance at a regularly scheduled Association meeting, after recommendation by the Membership Committee. Applicants accepted to membership before January 27, 1973 shall be deemed to be Charter Members. It shall be the right of all applicants, who have been denied membership in the Corporation, to seek redress before an Ad Hoc Committee of five members appointed by the President. The Corporation may elect to Honorary Membership those individuals nominated by an Officer and/or Board of Director Member of the Corporation. These individuals must be of good standing and be supportive of the Corporation’s goals and objectives. These Honorary Members may attend the functions sponsored by the Corporation, but do not have the same standing, or voting privileges, of our Active or Associate members. Honorary Members, unless approved by the President and the Treasurer, must pay dues to the Corporation. Failure to pay dues in a timely manner, by Honorary Members, is sufficient grounds for immediate removal from the Corporation. Dues for membership in the Corporation, payable to the Corporation every July 1st, shall be fifteen ($15.00) dollars per annum. Members who are late in paying their dues by more than thirty (30) days, shall be fined one ($1.00) dollar for each thirty days these dues are late. In the Corporation are memberships that are known as Lifetime Members. Lifetime membership is available to any member with at least twenty (20) years in the CSPAAA and who is at least 55 years of age. The cost of this membership is $120.00. Any member who is in arrears for one (1) year shall be dropped from the Membership List. Members who have been dropped from the Membership List, who re-apply to the Corporation for membership, must pay their previous past late fees plus the current Annual Dues before being re-considered for such membership. At no time is this to exceed forty-five ($45.00) dollars. The officers of the Corporation, all of whom shall serve without pay or renumeration of any kind, shall consist of a President, First Vice President, Second Vice President, Third Vice President, Fourth Vice President, Secretary, and Treasurer. In addition, the President may appoint a member to the position of Special Assistant to the President. Officers may succeed themselves in the same position. The Board of Directors shall consist of eight (8) members, four to be elected each year to serve for two years. Members of the Board of Directors may succeed themselves for two-year terms. The Immediate past President shall be a member of the Board of Directors. Officers and Directors shall be nominated each year at the April Monthly Meeting, the exact day, time and place to be decided upon by the President. Officers shall be elected at the Annual May Meeting and shall serve for a one year period, starting on the day of their election and terminating when their successors have been duly elected. A Nominating Committee, comprising not less than three and not more than five members, shall be appointed by the President prior to the April Monthly Meeting. The Nominating Committee shall present, at the April Monthly Meeting, a slate of nominees for election as President, First Vice President, Second Vice President, Third Vice President, Fourth Vice President, Secretary, Treasurer, and Board of Directors. Any member of the Corporation may make nominations from the floor. In the event of balloting, three tellers shall be appointed by the President to receive ballots for each office and candidates for the Board of Directors. They shall canvass the ballots so cast and announce the results to the presiding officer, who shall thereupon declare the members receiving a plurality of the votes case elected to their respective offices. The presiding officer shall preserve order and decorum and questions of order shall be decided by him/her subject to an interpretation in accordance with Robert’s Rules of Order. The President shall appoint a Sergeant- at – Arms to serve at the pleasure of the President. These duties shall consist of preparing the Meeting Hall for the Annual Meetings, with proper seating and display of the American Flag. He/she shall provide any necessary public address systems, dais, and whatever other arrangements are necessary for the dignified and orderly conduct of such meeting. He/she shall cordially greet each guest speaker prior to his scheduled appearance on the rostrum, extending them every reasonable courtesy and securing any equipment necessary for the successful presentation that the guest speaker is to make to the membership. The Sergeant – At – Arms shall not permit unauthorized persons to attend the meeting, nor allow activity that will tend to distract the attention of the members from the matter at hand. The Sergeant – At – Arms shall assist the President in preserving order and decorum and perform such other duties as the President may direct. It shall be the duty of the President to preside at all meetings and to enforce all regulations relating to the administration of the Corporation. In addition to the Annual Meetings the President may, by himself, or at the request of the Board of Directors, call a Special Meeting at any time. The President shall appoint all Standing and Special Committees. The President, or his designee, shall also occupy one seat on the Board of Directors of the CSPAAA Educational Foundation. This position shall have full voting privileges on the CSPAAA Educational Foundation Board. In the absence from any meetings of the President, the First Vice President, or in his/her absence the Second Vice President, or the Third or Fourth Vice President, in that order, shall have the powers of the President for that particular meeting. In the absence of all five, two-thirds of the members of the Board of Directors present shall select a President Pro-Tempore for this particular meeting only. The board shall fill any vacancies occurring by death or otherwise during the time from one Annual May Meeting to another, and may, by vote of two-thirds of the total number of Directors present, remove any officer for cause after a hearing. A quorum of five Directors shall be required to transact any business. The board shall elect its Chairman. The Board of Directors and/or the President shall have the power to make charitable donations, including memorial and sickness remembrances. It shall be the duty of the Secretary to perform such secretarial duties as may be directed by the President and Chairman of the Board of Directors. The Secretary shall conduct such correspondence activities and issue such notices of meetings as may be required or directed by the President or the Board of Directors. The Treasurer shall keep a true account of all monies received and disbursed and pay all legitimate bills after the same have been approved for payment. At the meetings of the Corporation the Treasurer shall make a full and correct report of same. The order of all business conducted at all Corporation Meetings shall be determined by the President. The Quartermaster shall be appointed by the President. The Quartermaster will assist the Educational Foundation’s Store Manager in maintaining the supplies, stock and inventory of the Corporation’s store. In the event of the dissolution of this corporation, all assets, after all bills have been paid, will accrue to the Treasurer of the State of Connecticut to be used exclusively for the benefit of the Connecticut State Police Academy. It is herein provided that no profits or fees will be paid to any officer, director or member of this Corporation. Constitution and By – Laws may be revised, or amended, by a two-thirds vote of members present at any Annual Meeting. Adopted on January 27, 1972, at the first Annual Meeting of the Connecticut State Police Academy Alumni Association, held at Yale University, 1088 Chapel Street, New Haven, Connecticut. I hereby certify that the foregoing by-laws are true and correct as amended and approved up to and including the May Annual Meeting, held on May 15th, 2001, at the Connecticut Police Academy, in Meriden, Connecticut. CSPAAA President, for The CSPAAA Officers and Board of Directors.